The FRIBBLE project is pleased to announce its first release V17.1.30, available at Fribble Project. FRIBBLE is written in SPITBOL, and uses a brute-force approach, trying all possible moves, to play WWWF. Fribble can be run in three ways: to play against itself, to play against you, or to help you play a game with a foe, with Fribble finding your moves. The code speaks for itself. Speaking for my self, I can say that I have never had more fun writing a program than I have had writing FRIBBLE. FRIBBLE is also my first program inspired by an election. I was an obsessive follower of the recent presidential election, spending more time than I care to admit on Twitter, reading blogs, listening to podcasts, and so on. After the election, looking for a more productive and entertaining form of amusement, I started playing Words With Friends, an online version of Scrabble. My foe was a fellow IBMer and friend who said he was quite good at WWF. Indeed he is. We have played many games and I have yet to beat him. Often his score is 50% higher than mine. Soon after I realized I was unlikely to ever win a game against him, I though of using my programming skills to see if I would write a program that could play WWF. Fribble, representing just over two months of the most fun I have yet had writing a program, is the realization of that goal. What has made the writing of Fribble such fun is the realization that it is as close to an ideal demonstration of SPITBOL as I have yet seen. Everyone knows about games such as Scrabble and WWF, and dealing with strings, words, lines of text, dictionaries, and all that such games involve, is the perfect grist for SPITBOL’s mill. Though the program is largely done, I plan to continue work on it by using it as a way to teach SPITBOL as a first, or at least early, programming language. The SPITBOL project is pleased to announce that an implementation for OSX is now available, and can be found at github.com/spitbol/spitbol. SPITBOL now supports the use of the gas (GNU as) assembler to translate the MINIMAL source code. This is now the default translator used for Unix and OSX. ./docs/green-book.pdf The SNOBOL4 Programming Language, Griswold, et. al. SPITBOL is licensed under the GPL (v2 or later) license. All code needed to build the system is included in this repository. See readme.txt for instructions on interpreting the test output. 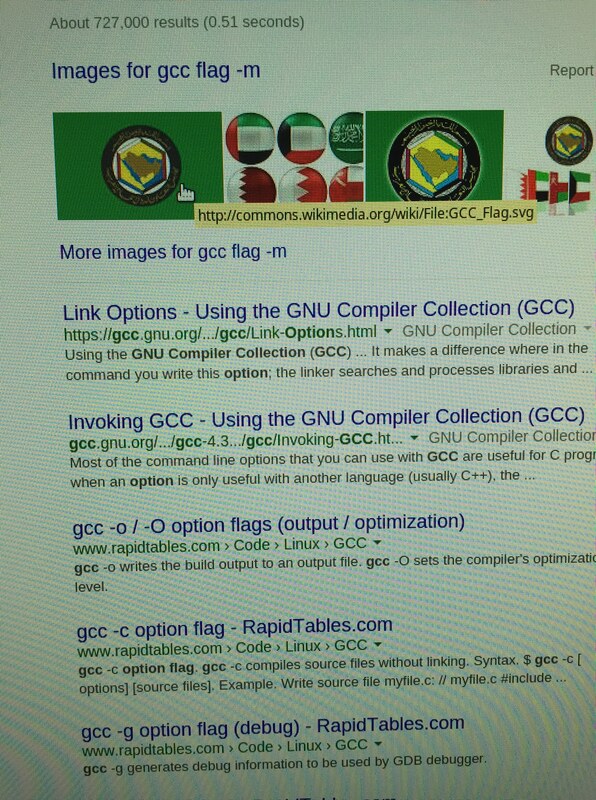 While trying to look up some information about the gcc compiler, I did a search on ‘gcc flag -m’. Search results for ‘gcc flag -m’. This is the first time I have ever searched for info about a compiler option (they are also called flags) and gotten a picture of a real flag. Thing is, I can’t find the picture of RMS on the flag. 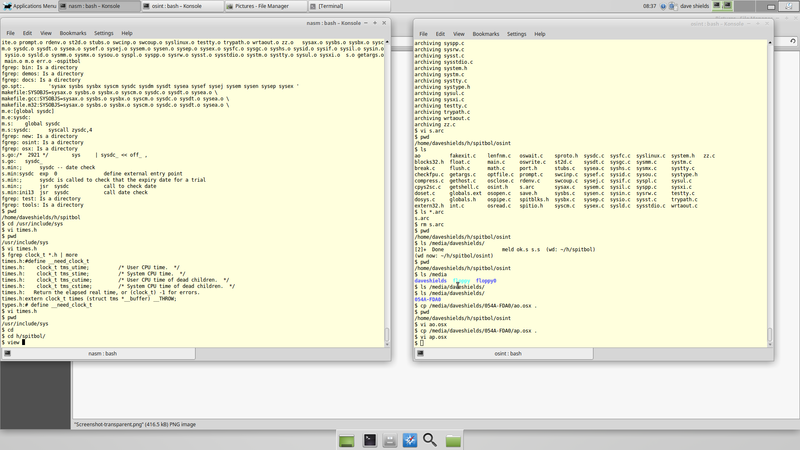 Usual mode – two opaque terminal windows. There’s a new terminal window in the middle, but it’s transparent — you can see through it to the windows below. 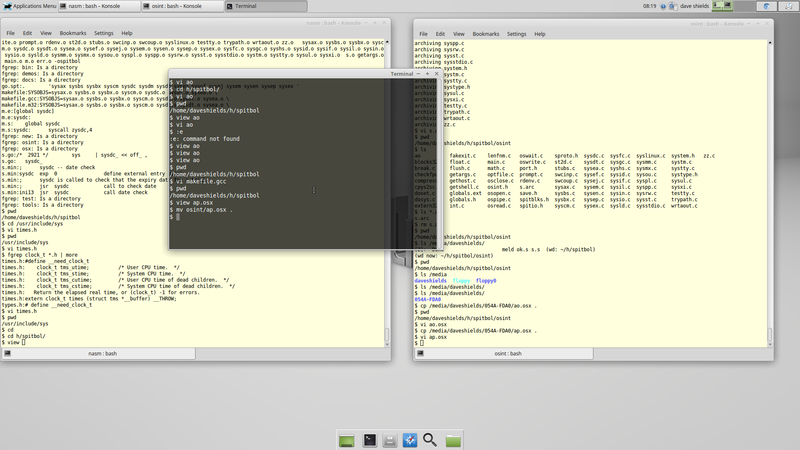 Now I had known about transparent terminal windows for some time, but I had never never gotten around to trying them. I was happy with my usual mode of just two opaque windows. 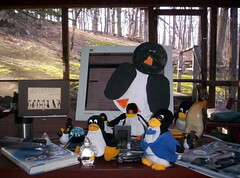 A couple of weeks ago I updated my desktop to use the latest version of Linux Mint. Though Mint comes with the Konsole program, you have to dig around in the menus to find it. There’s always a quick link to a terminal program in easy view, but it’s not for Konsole. Though the transparency is a nuisance when just editing text, it’s great for other situations. For example, if I need to do a small task, and don’t want to disturb my two normal windows, I just open up a transparent window. through the window, and enter them directly with much less chance of error. The SPITBOL project is pleased to announce that Unix SPITBOL 13.05 is now available. It can be downloaded from http://spitbol.googlecode.com/files/spitbol-13.05.tar.gz. This release includes versions of SPITBOL for both ASCII (8-bit characters) and Unicode (32-bit characters). The Unicode version of SPITBOL (uspitbol) uses 32-bit characters internally. Character strings are converted from UTF-8 encoding to 32-bit characters when input from the command line, the operating system environment, a pipe, or a file opened in line mode. Character strings are converted from 32-bit characters to 8-bit characters in UTF-8 format when written to a file opened in line mode, a pipe, or when passed as an argument to an operating system procedure. Program source files, which are read by SPITBOL in line mode, may thus contain UTF-8 format Unicode characters in strings and comments. Identifiers are still restricted to ASCII. The SPITBOL Project is pleased to announce that Unix SPITBOL 13.01 is available. This release supports floating-point arithmetic and save files. Load modules and the loading of external functions are still not supported. The source code for MACRO SPITBOL contains extensive documentation. I have extracted the specification of the MINIMAL (Machine Independent Macro Assembly Language) and the specification of the OSINT (Operatint System INterface) and converted the plain text to HTML, resulting in what is now the “MINIMAL Reference Manual. The implementation of MACRO SPITBOL is written in three languages: MINIMAL, C, and assembler. The SPITBOL compiler and runtime is written in MINIMAL, a machine-independent portable assembly language. The runtime is augmented by procedures written in C that collectively comprise OSINT (Operating System INTerface). These procedures provides such functions as input and output, system initialization and termination, management of UNIX pipes, the loading of external functions, the writing and reading of save files and load modules, and so forth. The implementation also includes assembly code. This size of this code varies according to the target machine. About 1500 lines are needed for the x86 architecture running UNIX. This code provides such functions as macros that define the translation of MINIMAL instructions that take more than a few machine-level instructions, support for calling C procedures from MINIMAL, for calling MINIMAL procedures from C, for creating save files and load modules, and for resuming execution from save files or load modules. To give some idea of the flavor of the code, consider the following simple SPITBOL program that copies standard input to standard output. By default, the variable input is input-associated to standard input, so each attempt to get its value results in reading in a line from standard input and returning the line as a string. The read fails if there are no more lines, and succeeds otherwise. Similarly, the variable output is output-associated with standard output, so each assignment to output causes the assigned value to be written to the standard output file. and is written using NASM (Netwide Assembler) syntax. The post is a bit dated. A lot has changed in the last five years, so here’s an update on how I currently access flash drives on my Ubuntu 12.04 desktop. There are two ways to do what in Linux is called “unmounting” the flash drive.